DAF Trucks NV - Netherlands manufacturer of trucks, a division of PACCAR. The company's motto: Eng. Driven by quality, Rus. Driven by quality. The headquarters and main factory are located in Eindhoven. Cabs and chassis are produced in Westerlo in Belgium. Some models of trucks that are sold under the brand DAF, Leyland Trucks worked in factories in Great Britain. In 1928 Hubert van Doorne founded Commanditaire Vennootschap Hub van Doorne's Machinefabriek. Its co-founder and investor was Huygens Arnold, managing director of the brewery. Van Doorne car Huygens repaired several times. Huygens was so pleased with his work that he offered to give him money for his own business. Van Doorne started working in a small workshop in the territory of the brewery, where the collected metal cabinets, windows and stairs. Soon they began to produce horse, tractor and finally, road trailers. In 1932 the company, which is now managed by Hubert and his brother, Wim van Doorne, changed its name to Van Doorne's Aanhangwagen Fabriek (Rus. Factory trailers brothers van Doorn), abbreviated of DAF. Huygens left the company in 1936, and the company DAF was now completely in the hands of the brothers Van Doorne. After the Second World War there was a shortage of cars and trucks. It was a big opportunity for DAF. In 1949 the company started to make trucks, trailers and buses, changing its name to Van Doorne's Automobiel Fabriek. The first model of the truck was a DAF A30. In 1948, DAF launches at once two test models: a five-ton truck DT5 and the tithes DT10. To save the permissible length of the wheelbase, the cabin, it was decided to place on the engine, transferring all its shunting part of the front axle. Since 1956, the company refused to import DAF engines borrowing policy and released their first, though licensed, diesel engine DAF Leyland. In 1967, DAF has opened a new plant in Borne car manufacturing. DAF 44 is the first model that was made there. DAF sold unit for the production of passenger cars (currently known as NedCar) Volvo company in 1975. DAF Buses separated from the company in 1990 to become part of the United Bus. In 1996, PACCAR acquired DAF Trucks. 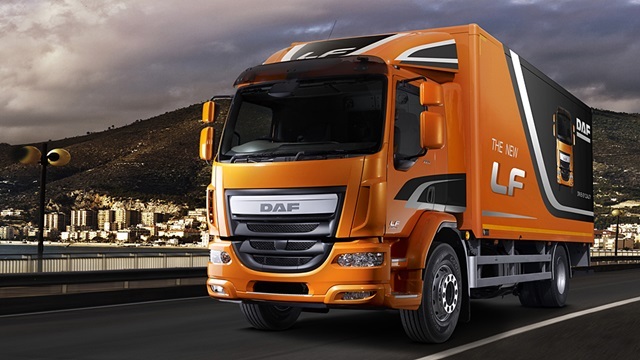 Currently, the company DAF Trucks is the world's largest manufacturer of commercial motor vehicles. DAF dealer network includes more than a thousand centers in Europe, Africa, Australia, New Zealand and the Middle East and Taiwan. Cabins: All cabins have cabover layout. The engine tunnel in the XF series low height - 12 cm. Cabin lighting is made on the basis of fixtures with a red filter that allows you to turn on the lights in the cab on the go without fear of glare. In all models, "Daf" has a mat on the instrument panel, which in the case of bottling beverages (tea, coffee and so on. D.) Will protect the electronics of the instrument panel. 1980: DAF trucks started to the Dakar Rally, winning in 1982, 1985 and 1987. In later years, they had a truck with double engine with a total capacity of more than 1000 hp (700 kW). 1988 Two trucks displayed at the start of the Dakar Rally. Jan de Rooya Truck on special stages took the 3rd place in the average, ahead of Peugeot 405 T16. Another truck overturned, killing Cees van Loevezijn. DAF fizzled. 1996: DAF began to participate in the European truck racing series, at first not very successful, but by 1999 almost become a champion. To everyone's surprise DAF eliminated. 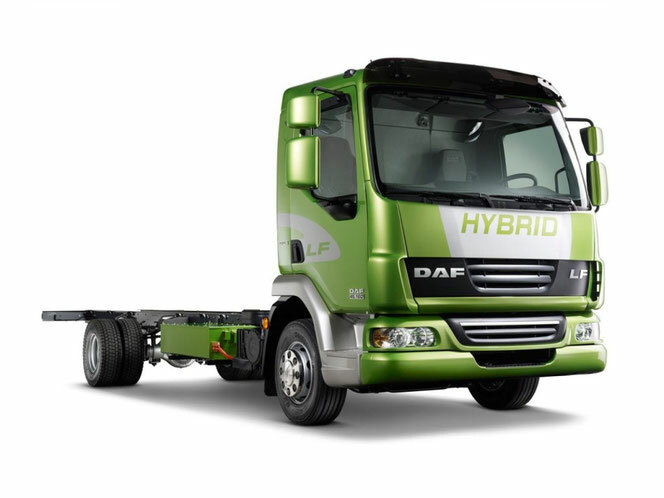 Already created a hybrid version of the DAF LF 45 hybrid. Tests have shown a very high efficiency of these machines. GUS like "Peterbilt" made by Eaton. Despite the high efficiency of transportation, often have difficulty with available capacity, which greatly affects at drop heights and high angles of ascent.